For a limited edition collection of handwoven pillows exclusively for CB2, a trip to Peru inspired me to experiment with bold blocks of color. I was fascinated by the vibrant clothing worn by locals in contrast to the country's adobe architecture. Using traditional floor looms in my Chicago Studio, each pillow was woven by hand one thread at a time of 100% US organic cotton and hand dyed wool sourced from Meadowcroft Farm in Maine. Read about Dee's trip to Peru on the Herron blog. 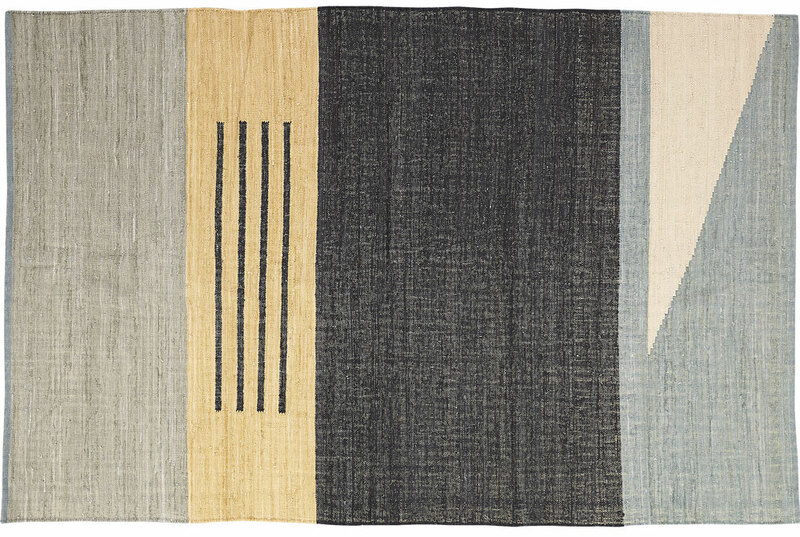 Muted flat-weave bands together tonal greys, tan and soft blue, accented by clean white triangle and trio of black lines. Architectural elements and familiar urban surroundings were the inspiration for the handwoven cotton Code Rug. Designed exclusively for CB2. Primary + Shape Pillow, flat woven cotton pillow designed for Cb2.